Bathroom Blogfest 2010 #3: Stuck in the doorway? 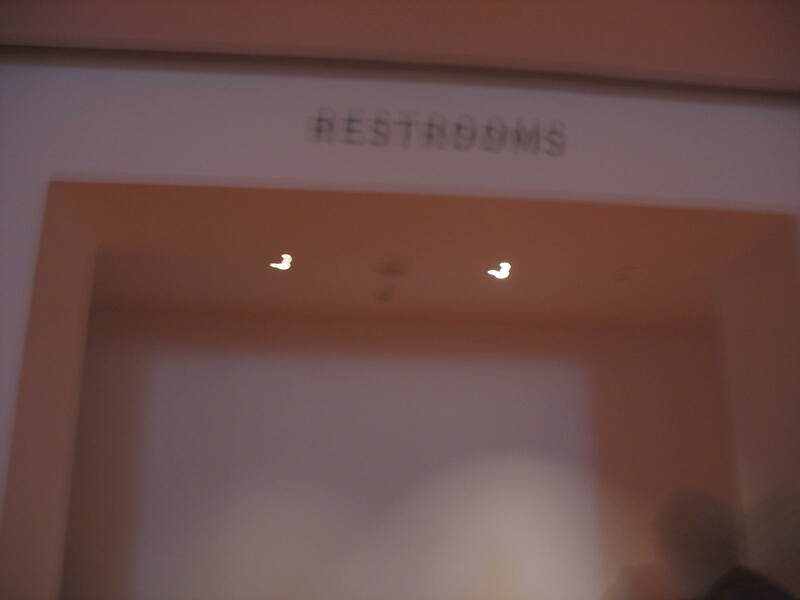 Thanks to Bathroom Blogfest 2010, I have an opportunity to share a series of photos that Beth took when we visited Walt Disney Concert Hall in Los Angeles last year. 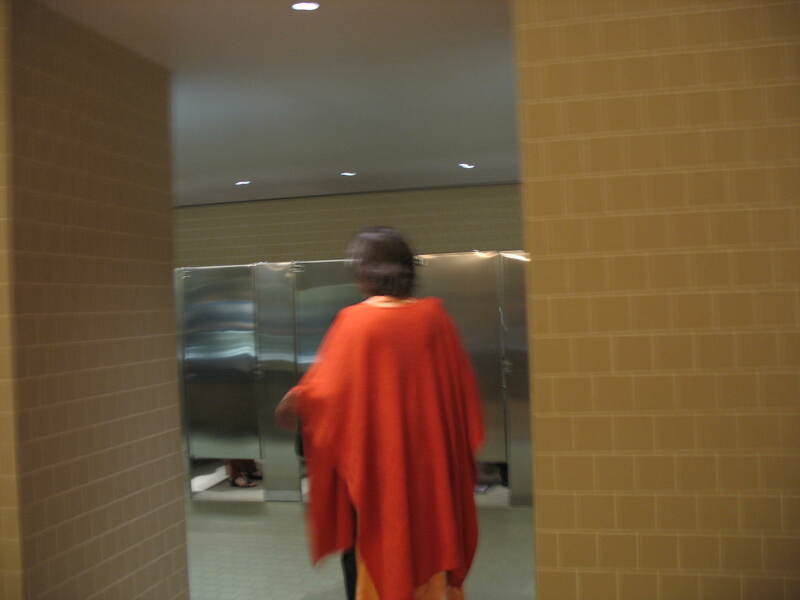 It took her so many twists and turns to get from the entrance of an upper-floor women’s restroom to the actual stalls that she was inspired (if that is the right word) to document the experience. Apologies for the blurry quality and varying exposure – these were taken quickly, during a break in the concert. 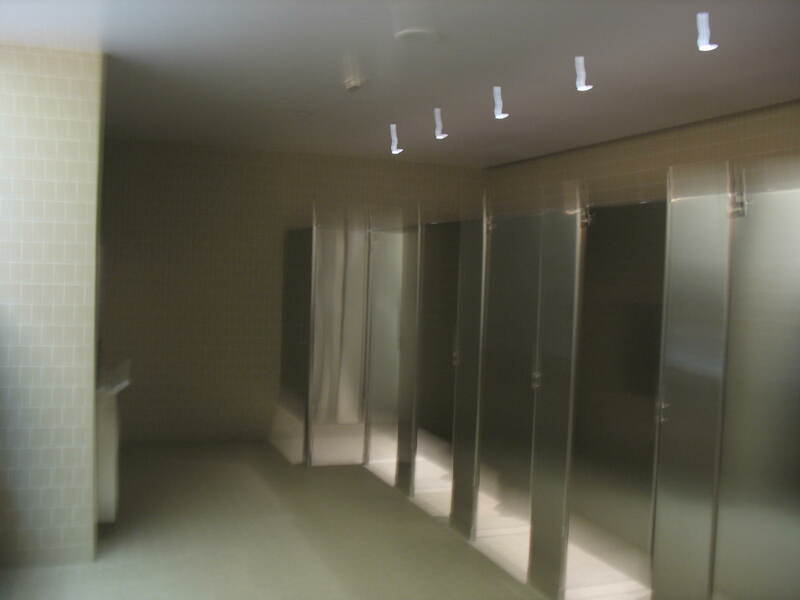 … the actual bathroom stalls. Note that the so-called handicapped stall is located farthest from the hallway. There are several striking things about this restroom experience: the narrow doors, the inadequate lighting in some areas, the number of twists and turns — all hell for someone with mobility or balance problems, let alone in a wheelchair or using another assistive device — plus the time and distance from the entrance to the stalls. What’s even more striking is that this building was (famously, by Frank Gehry) designed and built in the first decade of the 21st century. It’s obviously an afterthought, crammed into available non-revenue-generating space. 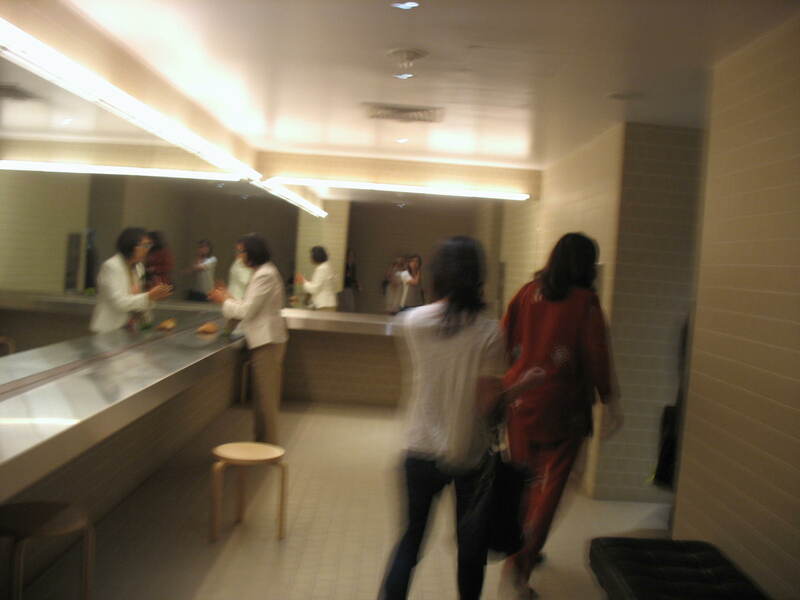 No one was thinking of restrooms as an integral part of the visitor experience at Disney Hall. Stuck in the 60’s? Not exactly – but for someone using this particular women’s restroom, it would be all to easy to become stuck in a doorway. Thanks to the folks at Results Revolution for listing my first Bathroom Blogfest post. They bring up some good points about restrooms as key places where the concept of visitor comfort can be extended or utterly neglected. Another BB post linked from the same entry is from the Kitchen and Residential Design blog by Paul Anater. 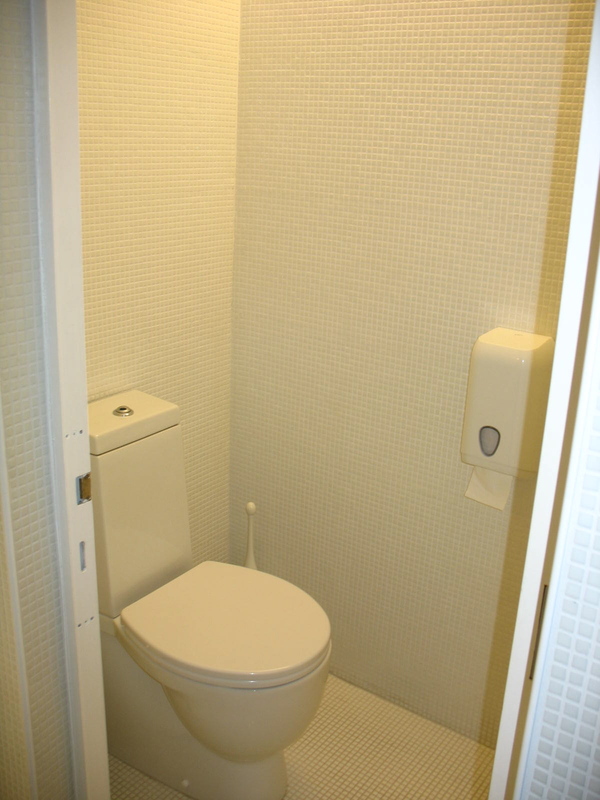 He notes that being “stuck in the 60s” (the theme of this year’s BB) isn’t necessarily a bad idea if you’re talking about bathrooms, and provides illustrations of some classic modernist, human-scale bathrooms from the early 60s that look as if they could have been designed today. 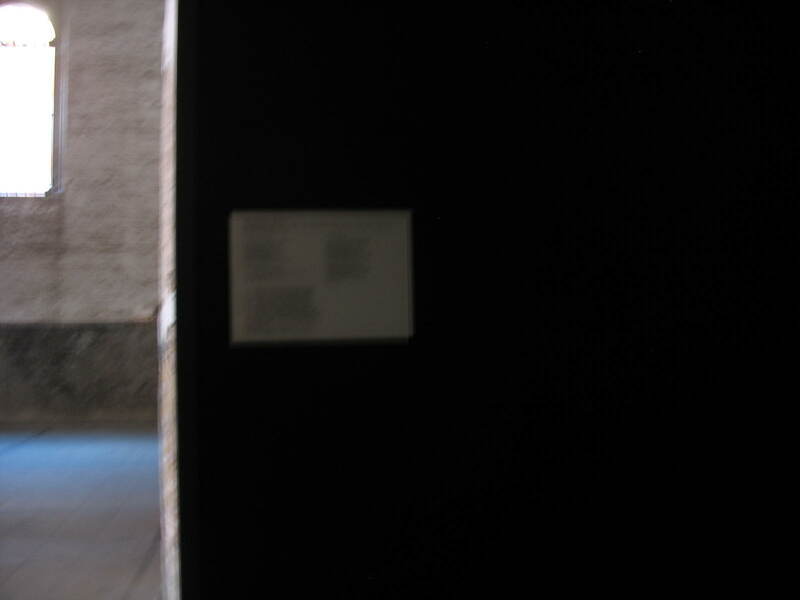 In that spirit, here’s a women’s restroom (photos by Beth) from Palazzo Grassi, the just-too-cool museum of minimalist, conceptual, and terminally hip art in Venice, Italy. As I noted in an earlier post, the seating in this museum is lacking, to say the least; but the restooms are clean (literally and design-wise), simple, and classic – completely in keeping with the White Cube look and feel of the museum. In terms of access for people with mobility problems or in wheelchairs, they are a bit tight, however. 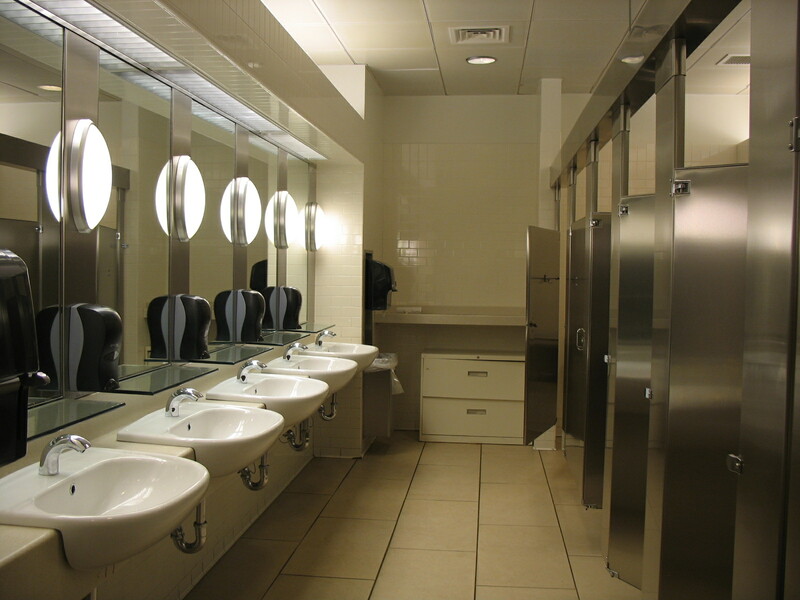 Since restrooms are essential to comfort in most public spaces — indoor ones, anyway — we’re happy to join the discussion. This is on the ground floor of the Metropolitan Museum of Art in New York, in a lobby area that was renovated (I believe) in the 60s. 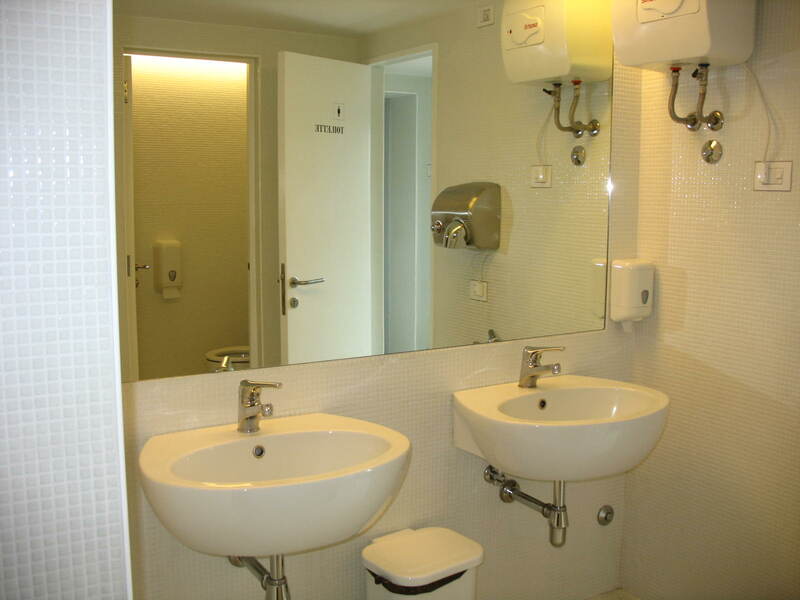 This restroom has the virtues of a 60s modernist space – straightforward access to all stalls as soon as you open the door, sufficient space between the stalls and the sinks, no awkward angles – updated with contemporary 21st century fixtures. The adjacent men’s room has pretty much the same layout. As usual, the Met does things right. 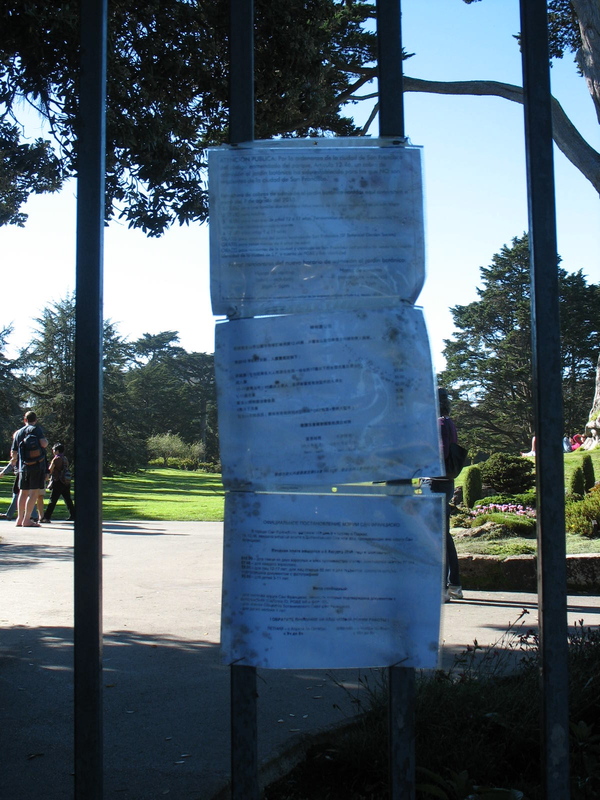 San Francisco Botanical Garden: Just Go Away? 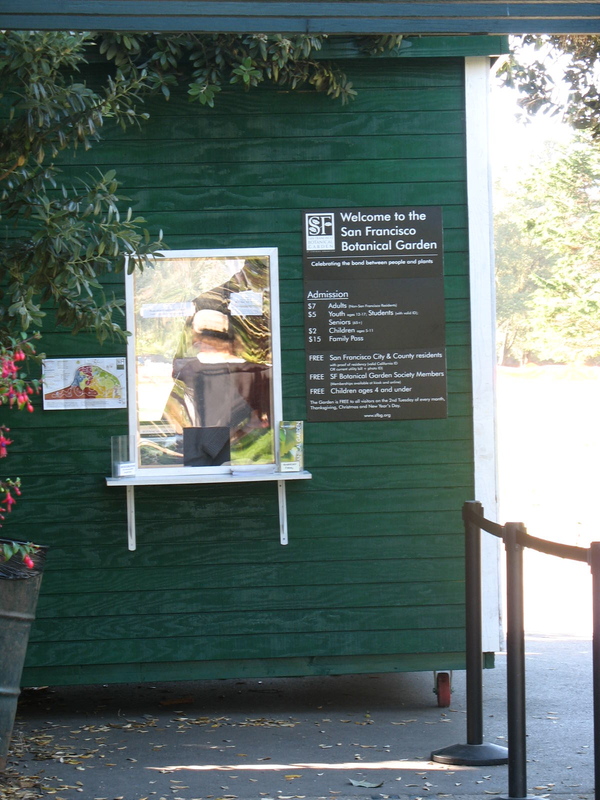 Ever since the San Francisco Botanical Garden started charging admission to visitors who are not residents of San Francisco, there has been a dramatic drop in the overall number of visitors. It’s obvious that SF residents are staying away, even though they still get in free. Why? 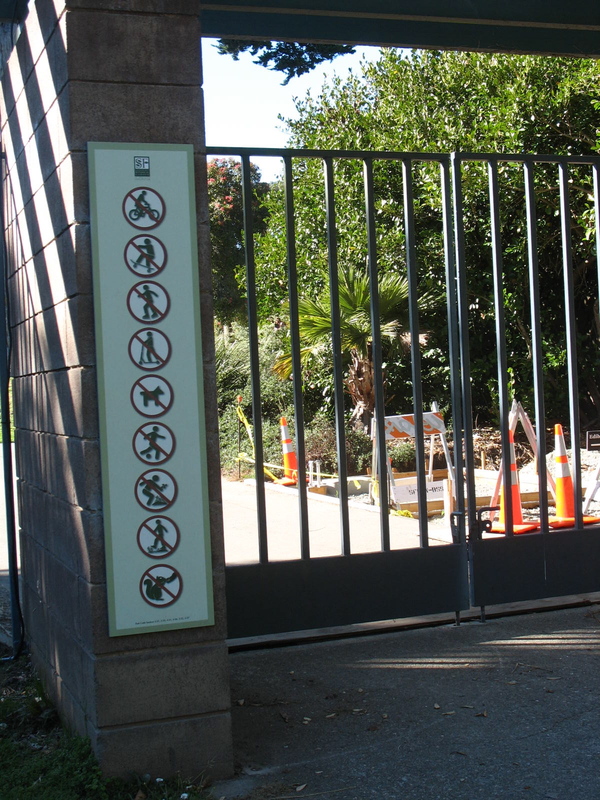 Taking a leaf from Stephanie Weaver of Experienceology, Beth and I decided to look at the Botanical Garden entrance experience to see if it had somehow been made inherently unwelcoming. Are potential visitors being subtly prompted to turn around and go away? When it was free, you could just walk in through a wide-open, welcoming gate. Now the gate is closed, and the first thing that greets you at the main entrance is a kiosk. 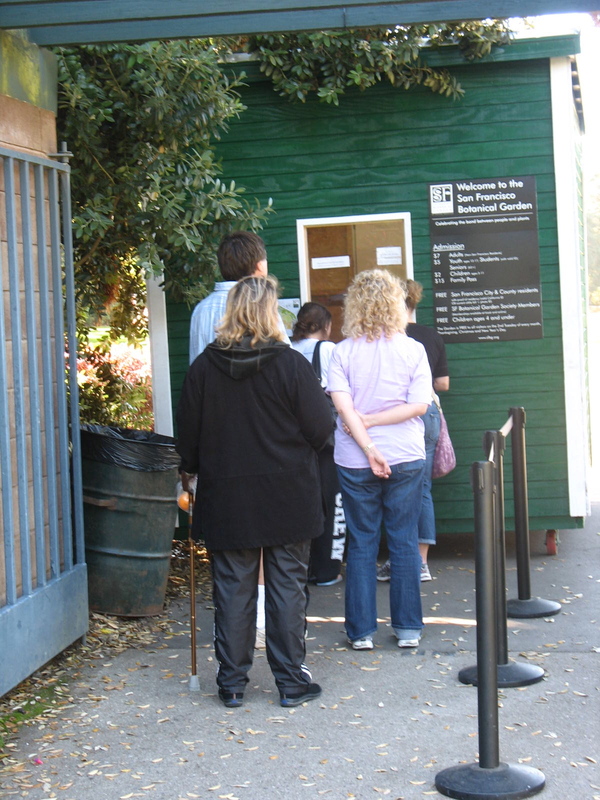 There is often a line, because even those who don’t pay have to stop and show San Francisco ID. 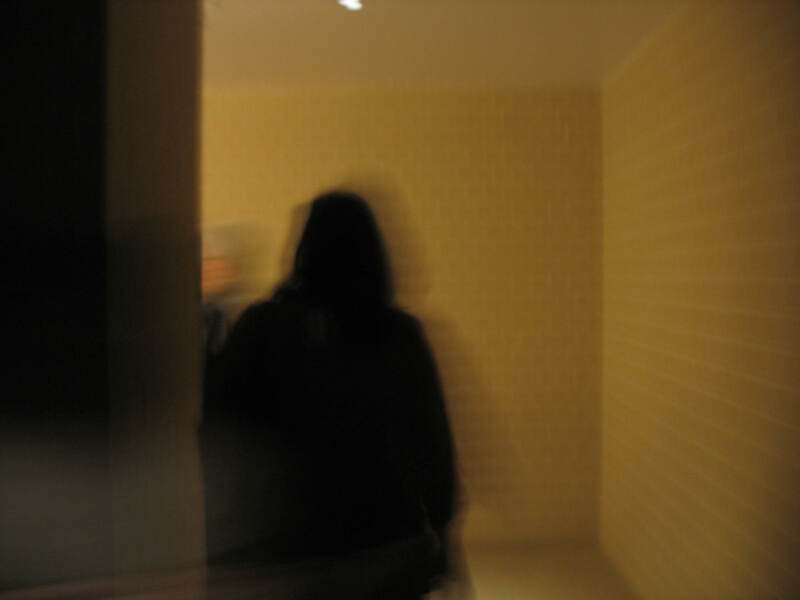 When you get to the head of the line, the booth is dark, and the person inside is semi-invisible. Welcome to Passport Control! May I see your papers? Next to the booth there is only a narrow space through which to enter the garden. To the right of that is a fence. Note the ugly construction cones (this is a garden?) and the sign forbidding you to do you pretty much everything. How do you say “keep out” in Spanish, Chinese, and Russian? Of course, nothing says “afterthought” like paper and Scotch tape. Hey, you kids, get off my lawn! Okay, I guess we will. 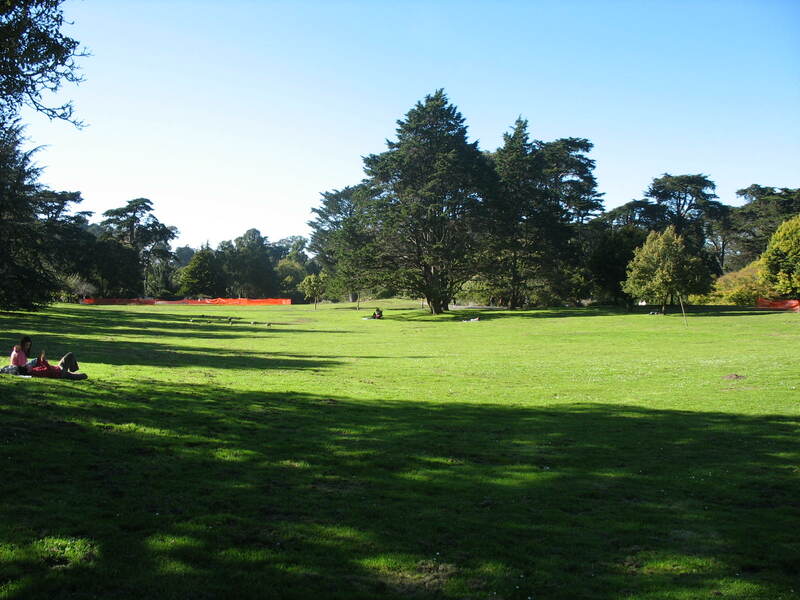 A clear, warm, windless day on a holiday weekend in San Francisco, not a cloud in the sky – and hardly a visitor in the Garden. Back when it was free, this lawn would have been dense with visitors, tranquilly enjoying the sun. These stone benches, located in an especially warm corner of the garden, would have been crowded with people, many of them elderly. 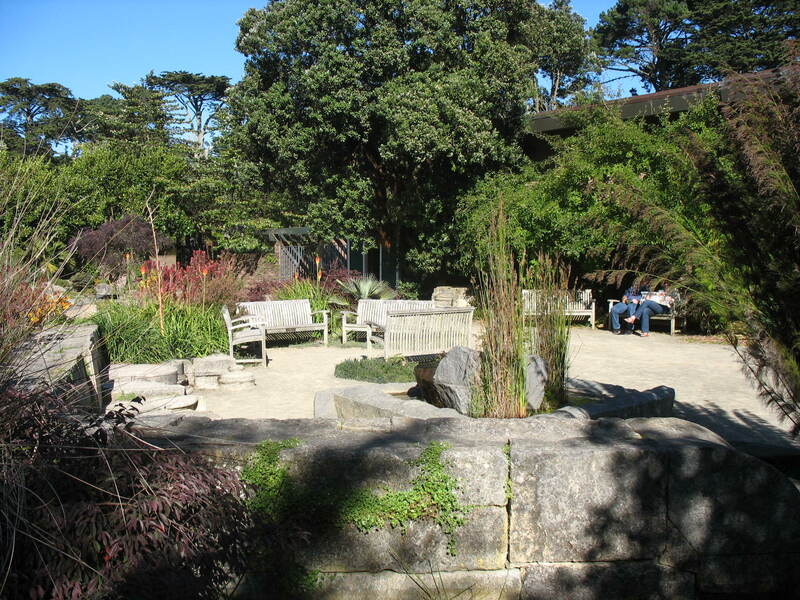 It’s pretty clear that in setting up an admission process for all visitors, whether or not they actually have to pay a fee, the San Francisco Botanical Society has managed to discourage people in general from visiting their now exclusive-seeming garden. They couldn’t have done it better if they had planned it that way. 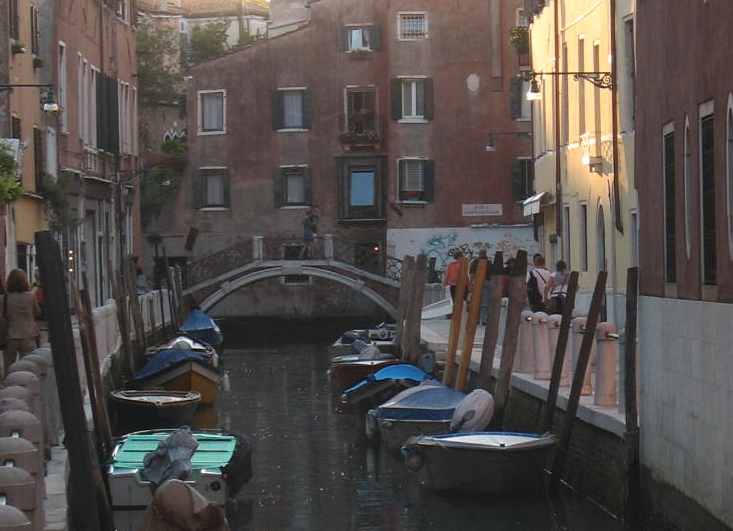 When we visited Venice, the 2010 international Architecture Biennale was under way. We weren’t that impressed with the exhibits themselves, which were mostly self-promotional, self-congratulatory, and/or superficial offerings from dozens of leading architecture firms and many nations. We were impressed, in a way, with some really, really bad labels. As in totally unreadable. Ridiculously faint, no? Pale tan on white. But it gets worse. Next to it is an even more unreadable label. Do not adjust your browser – there is text there, to the left of the tan text: off-white on white, in a smaller face. 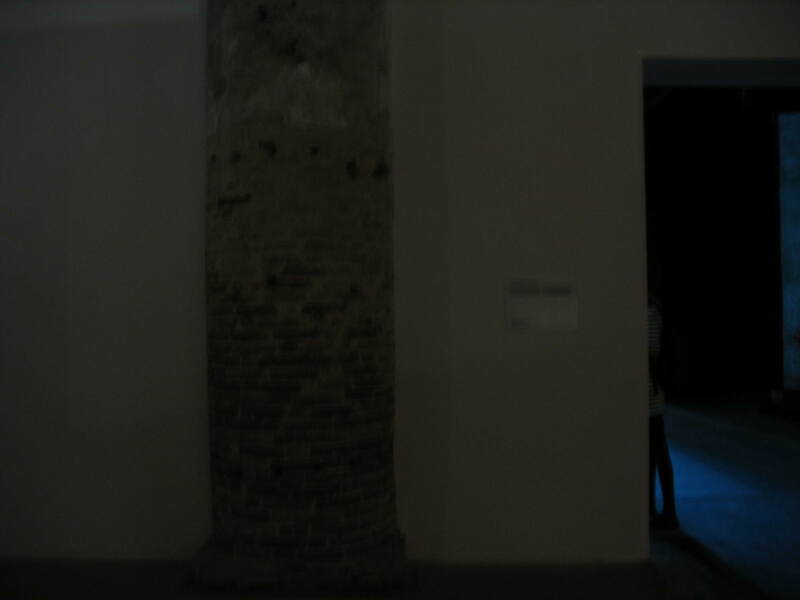 In contrast, so to speak, there were standard black on white labels at a nearby exhibit — but no light by which to read them. Yes, there is a label there, to the right. This is not an underexposed image — that was pretty much the ambient light level. No flashlights were provided.  In this case, your eye adjusted to the brighter light in the background, rendering the darkened label in the foreground a blur. These labels serve as reminders that even highly paid, extensively educated design professionals can design, or approve, or at least be associated with designs that are downright laughable in their hostility to humans and human comfort. 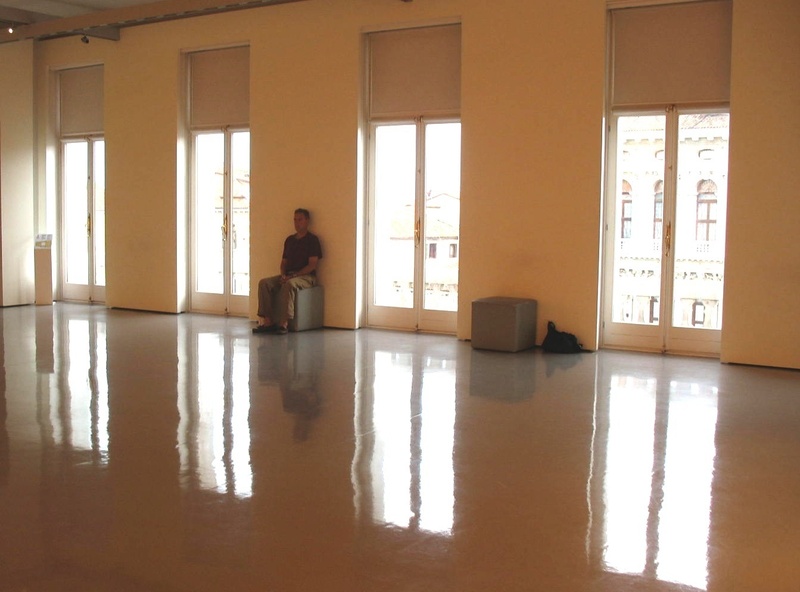 Palazzo Grassi is a museum of contemporay art in Venice, Italy. From the outside, it’s a classic Venetian palazzo fronting on the Grand Canal. 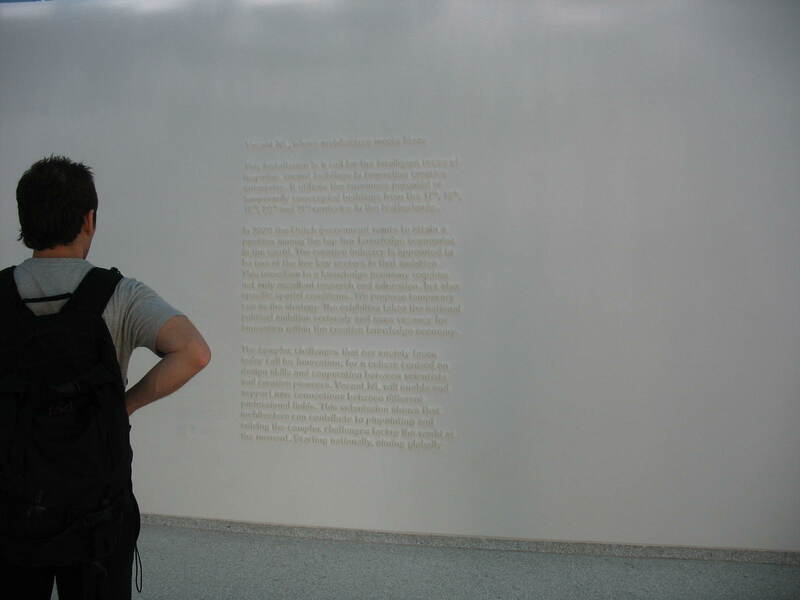 The interior has been extensively remodeled into a series of classic White Cubes displaying a major collection of minimalist and conceptual art. That’s it: two padded cubes in one room of a huge five floor museum. A grim denial of the frailty, or even existence, of the human body. Talk about suffering for Art. On the other hand, there wasn’t a lot of competition for these cubes. We were two of only about a dozen visitors in this heavily promoted museum – in a city that gets tens of thousands of tourists a day. 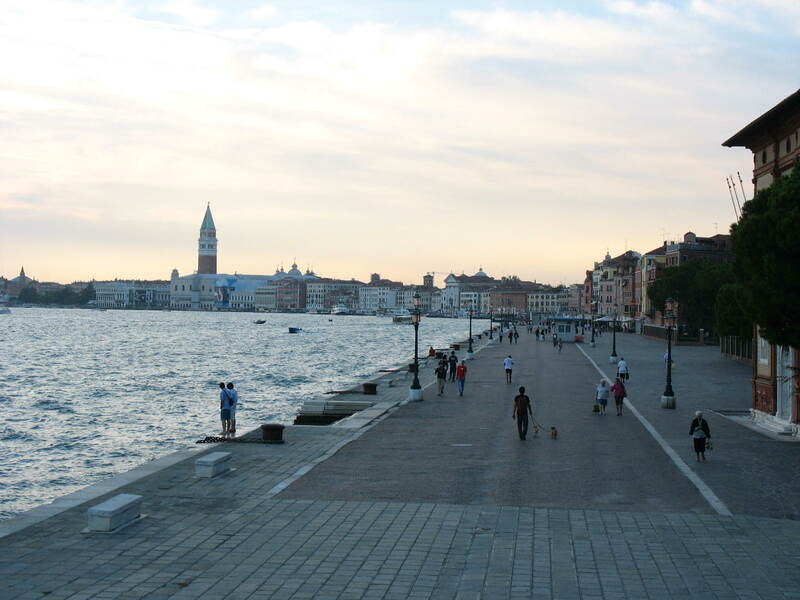 The city of Venice can be overwhelming. It’s visually stunning in ways I did not expect from descriptions and photos. Its setting on a lagoon lends it a downright luxurious sense of light and space. 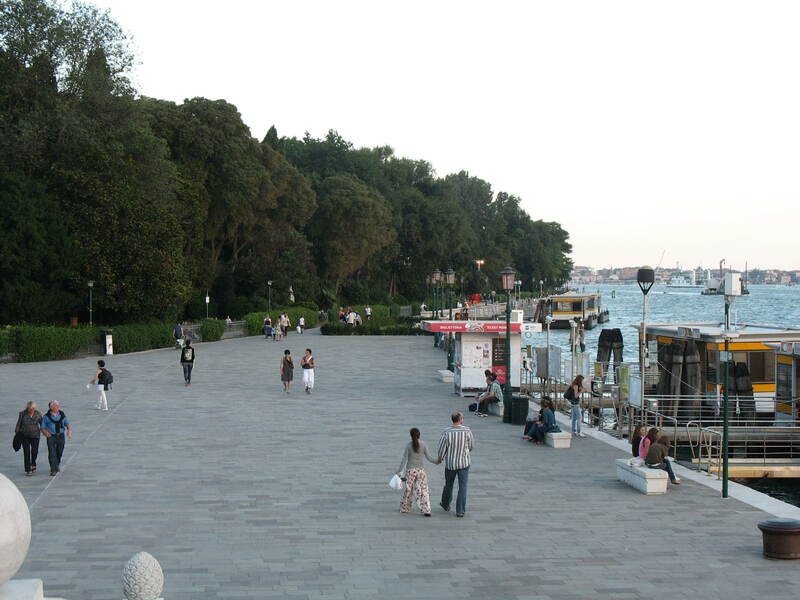 And, with no motor vehicles or even bicycles present anywhere, it’s a city made for walking, strolling, and sitting. Of course, tourists are everywhere, crowding the ancient streets, many of which are now lined with tacky shops rather than practical stores selling day-to-day goods for the vastly outnumbered residents. 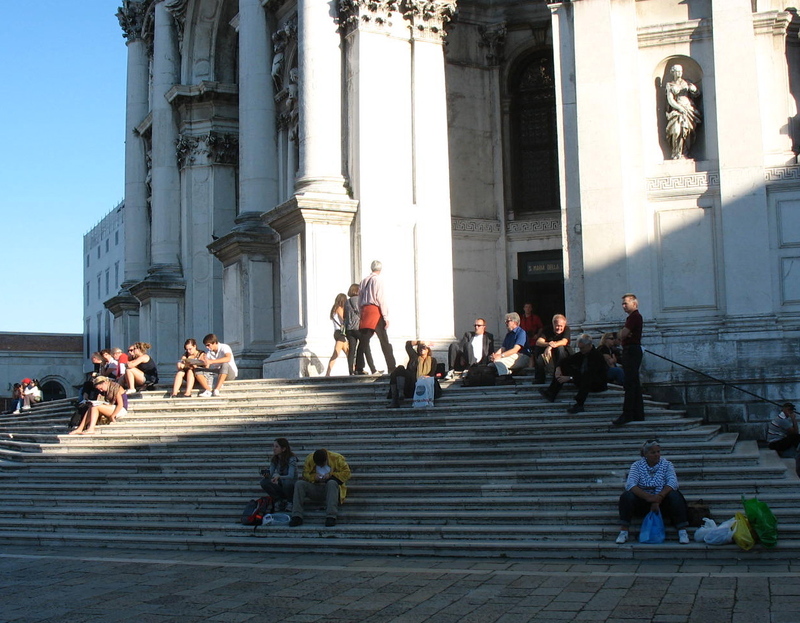 And from an accessibility perspective, Venice can be tough. There are countless bridges crossing canals of all sizes, which means you’re out of luck if you are mobility impaired. However, one thing Venice does have is places to sit. Plenty of them. There are church steps everywhere, and benches, and wharves, and steps leading down to water, and just plain inviting spaces with stunning views (and quirky contemporary art). 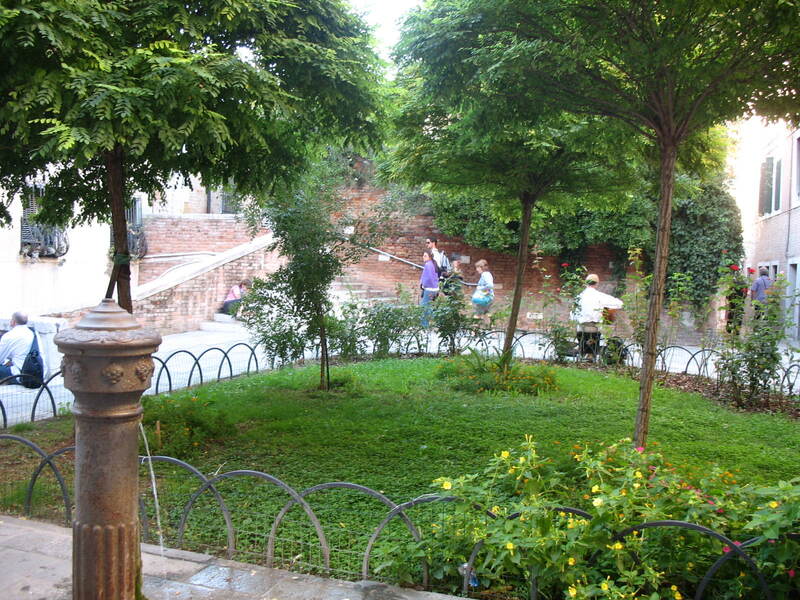 Turn a corner, and you’ll find yourself in a small, quiet square. 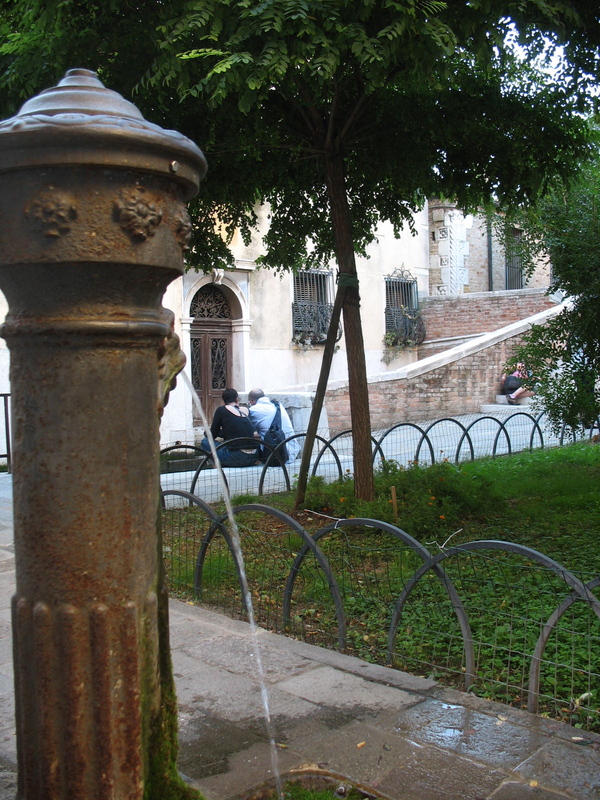 This particular square, like many Venetian spaces, featured a lovely public amenity: a fountain with drinking water. With its layout and most of its architecture basically unchanged since around the 18th century, Venice gives meaning to the overused term “human scale.” It simply feels good (of course, we were there before the winter rains began). 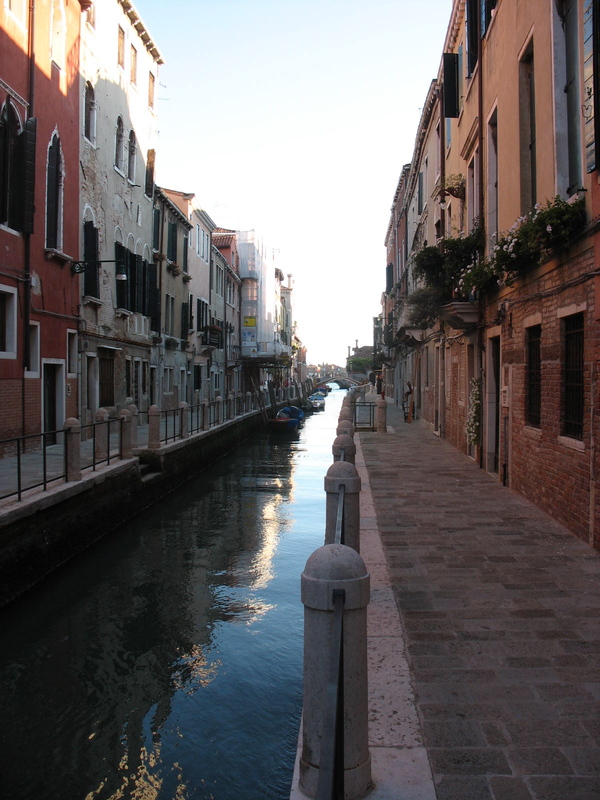 From a visitor’s perspective, Venice is in many ways one of the most comfortable cities I’ve ever been in. 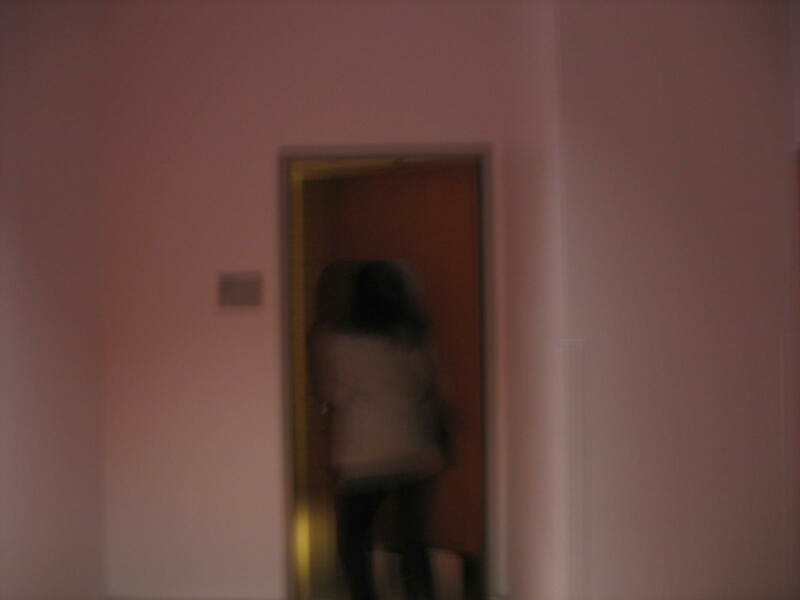 You are currently browsing the Please Be Seated blog archives for October, 2010.